Last edited by FreeAgent; 14th October 2016 at 12:23. 7 year wait? Tempting as It sounds I think I'll pass. A new model might be out by then! just has a geek following and the SD is just a thick (read into that too thick) Sub for £2k more, and while liked on here it's too bulky imo and just for people who don't want a Sub because every one has one ! most AD have all 3. I'm not entirely sure you know what the "h" stands for in that abbreviation. I was in that store last week and put my name on their list. The salesman told me "about three years". I told him that's fine as I will probably be able to get away with it in 3 years! David M Robinson in Liverpool won't take any more names for the Daytona or GMT BLNR. Wow, a watch (current model of a mass produced watch) in a window display of a watch store and long waiting list for the new Daytona. Thanks for your reply - I'm sure if it was a current mass produced Submariner people would be excited, just trying to help out those who might be after one of the above as it's unusual to see them all in stock (particularly the sea dweller - whether you like it or not). 7 years, if it be anything like true, is a total and utter pi$$ take. It's sounded like a number he plucked out of the air to be honest - particularly if someone at the same AD was told 3 years only last week! But these are just lists that people are free to drop out of at will, perhaps if the AD insisted on a 10% or 20% deposit, like they do with the Omega limited edition lists then the lists would be a whole lot shorter. I guess that would stop people trying to get on multiple lists - is this common watch practice then ? And the annoying thing about these 'lists' is that not anyone can just place themselves on it. You have to have a bit of a purchasing history of x amount/over x many years. Utter nonsense I tell you. I am on their "list" for an SDc...........I've not had a call??? Utter pretentious shite. I hate crap like this. Even if you're one of the privileged few to have such obscene amounts of disposable cash to spent on trinkets, you might not be special enough to write your name on our piece of paper. F*** off. Milgauss aren't in short supply either.Subs definitely are scarce though. I was told by Goldsmiths that they are obliged to forward the names of people on their list to 'Head Office' and that covered the whole group including retailers like Mappin and Webb etc and if anyone was found trying to get on multiple lists then their names were removed. My local PP AD told me that they like to vet the people going on their lists, not sure apart from previous history how they do that, to stop desirable sports models ending up still sealed at Watchfinder a few days after sale etc. Based on stories on here, like the four month wait for a blue dialled Nautilus when most ADs have closed their lists suggests that the lists are not strictly followed. I'm "just anyone" and I got on the list at WoS Canary Wharf. I was just browsing, no purchase history there and i asked if they had a ceramic Daytona list. The sales guy said yes and said it was a 3 year wait so I gave him my name. Of course, the whole 3 year wait story could be a load of rubbish. I am surprised that people take this projected wait times seriously. It is all dependent on supply,demand and distribution patterns none of which are constant and 2,3 or 7 years is a long enough time for this to change. I struggle to believe there is someone sat at Rolex reviewing lists looking for the same name so they can cross it out. I have my name down with several dealers for a Hulk and I told all the dealers of this as I didn't wish to waste their time. Most of them simply said that it wasn't a problem as if I didn't take the watch, there were plenty more who would. Last edited by soundood; 13th October 2016 at 21:17. WTF? No mention of Daytona wait times. Don't they know how many are eager to know the wait times? i have heard that they are stopping making the steel subs from November…..
Tell us what you really think.... lol. 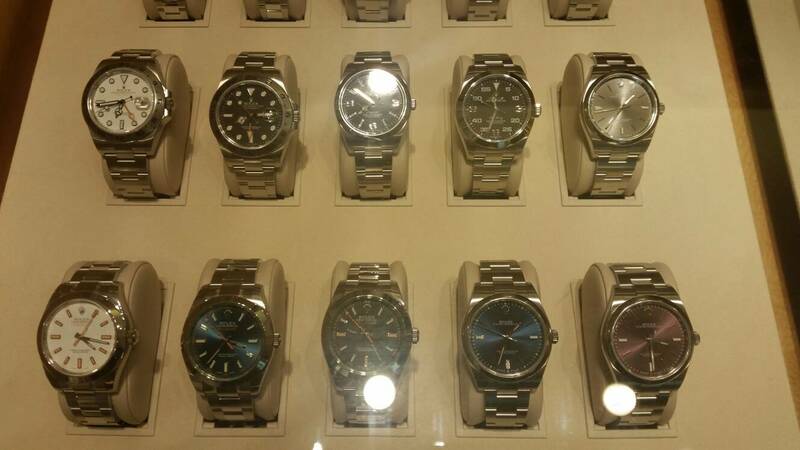 I don't even like Rolex and I can find them without looking there where loads in the shop in Nice [next to the heads on poles by the tram line]. there where yukmasters, green dials, gold etc.I took pics if you want them? I found them in other shops as well all over southern Europe. I went in to see the Tudor 36 which was lovely but seemed to be on a girly size strap. I will admit to trying on the white dial explorer and liking the dial [much better in real life]. This is what I spotted when I was at Abu dhabi Terminal 3 last Sept 27. There's more than this but I'm not interested with the other displays. I think the point is there is a shortage of certain SS models in the UK. Of course you can get them abroad but they will be more expensive due to the meltdown of Sterling. 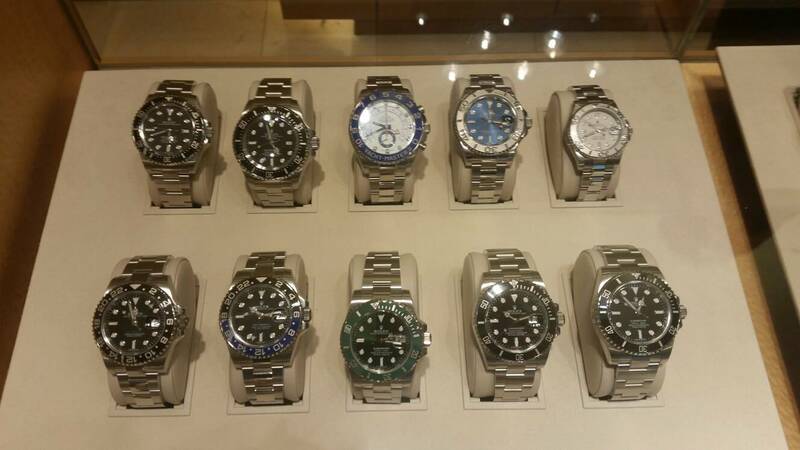 We have a shortage in part because of tourists buying up rolex models as they take advantage of their beneficial exchange rate. Please can we stop these pointless thread. Milgauss, ExpII, SD are available everywhere in the UK, including the often difficult capital that is London. If its a SUB or GMT, that would be useful I suppose for people looking for these. Also no point saying these are available in other countries, we all know that. No offence inteded, but in the US, EU, Japan, HK, you see these models very often, EVEN BLNR. 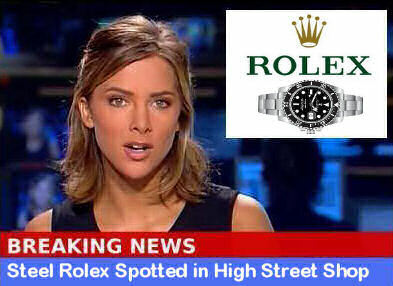 The point is that it is hard in the UK as UK is currently the COSTCO of Rolex in the world. The BLNR costs over 8000 Euros and the economic climate being what it is, there arnt masses of people waiting to spend 8200 on a steel watch all over Europe and hence they are more available. Now £5950 for a BLNR in the UK + the 16.67% VAT refund makes this a MASSIVE MASSIVE bargain and hence you will have HUGE difficulty finding one in the UK. I asked about a Rolex Oyster 39 mm at WOS on Regents street. They told me there was a waiting list. FreeAgent, would you mind editing the title of your thread (edit, go advanced) to, 'The UNIFIED Rolex in the window thread', there seems to be a growing consensus that one thread to rule them all would keep this place tidy and this is the one that's currently at the top. Congratulations, your thread will be famous! Last edited by Itsguy; 14th October 2016 at 09:57. We have moved on Richard, I opened a 'Heads Up' thread covering all watches and brands this morning. But thanks for this anyway. Ooooh, the frisson of competition! Which thread will win? We need a 'UNIFIED, unified all-watches seen in ADs' windows in the UK and in development on various forums' thread. I don't really mind Sean, I just thought it wasn't exclusive to Rolex, take limited edition Omegas or even the waiting lists for the PP sports models and the yearly releases from Baselworld seem to cover most of the big boys. As they say, the punters will vote with their feet. In the window pics, what's the watch towards the back right priced at £9500? What stainless steel sports is priced at that level? My fault I'm afraid, didn't see your thread and suggested it as this one was higher up at the time (thanks FreeAgent)... And yes it's most likely better to have an all inclusive all brands thread for this so time to start shamelessly bumping the other one to the top! Oops I've just bumped this one, oh well... This title could always be edited back if the other one is going to be the one. Whatever works best is fine. The other one has already had a decent heads up of a pilot watch and I posted details of a watch that I am keen to see in the flesh. It will take time for things to calm down and for people get used to contributing to a single thread - which ever one that happens to be. C**p - just bumped the wrong thread !! I was in Hong kong recently and not one BLNR or new Daytona in any AD window that I saw. I had enquired a while back at AD in bond street about BLNR and was immediately offered the honour of joining the wait list. I declined and bought one privately a few weeks later below RRP. 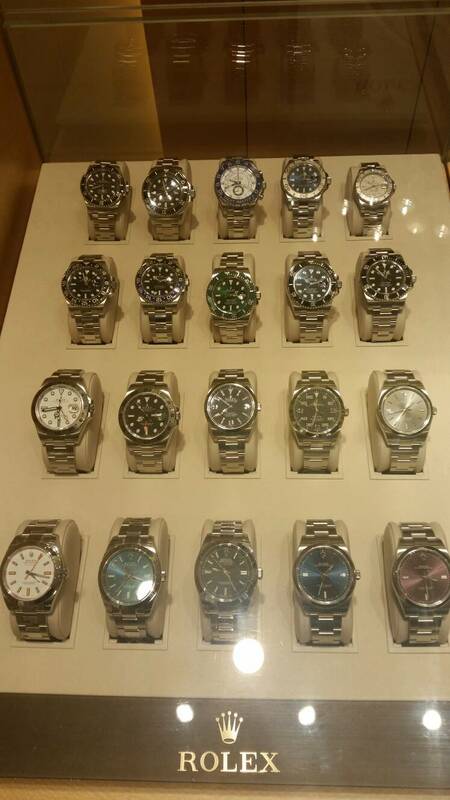 I don't see how scarcity really helps Rolex but there are clearly many others that benefit from it. I was offered a SS Daytona today,I was also told the 7 year wait is conservative it could be 10 or 15. Rolex don't check how many lists you are on. I tried a gold and a bi metal Daytona,also vintage subs one with the crazed dial. What I really liked was the large auto speed master I was offered that with a big discount along with lots of other watches. I also liked a iwc 7 day portugese and some old heurs. I assume you purchased it ????? No,I don't have any real knowledge,I didn't even ask the price,I think it might have been second hand is that still desirable? It's not my thing so I didn't follow it up. Though seeing the 1% or less interest rates it could be a investment? I wouldn't wear it and I don't know enough about Rolex what would it cost to buy? Why don't people buy the gold or bi metal?. I was also shown one with the numbers circling the dial Facing the centre that was SH. I was told the reasons it's in short supply, it all makes sense. The omega I got him to write down z dial speed master,co axial in house 2014 b and p £3,750 it was up for way more. I liked that one a lot is it a fair price?